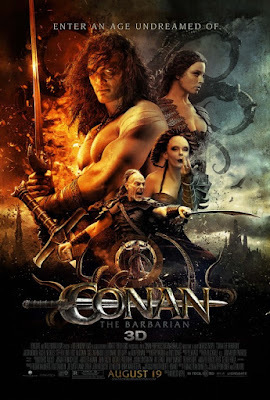 When I began seeing the promotional material for this reboot of Conan, I was immediately turned off, first and foremost by the casting of Jason Momoa as the titular Conan. Being the age that I am, I grew up on Arnold's Conan films, and to see someone who's a quarter the size of Arnold up there portraying Conan just didn't do it for me. And I wasn't a Game of Thrones fan, so I had never even seen anything with him in it. All I saw in the trailers was a much smaller man, wearing a skirt, grimacing endlessly and looking nothing like Conan should look like. So I skipped this one as I had no desire to see it. But when it's hard to find films to watch with your 12 year old son, the slim picking's make you watch films you otherwise would have avoided. I keep going back and forth with my feelings on Conan. First and foremost, as a swords and sandals fantasy film, it's really fun. There are a lot of technical aspects in Conan that rock. For starters, the CGI is kept to a minimum (YES! ), and when it is implored, with the exception of the final act, it's actually not that bad and integrated well within the practical effects work. That's kind of a big deal in my world, especially when you consider that most of these films are "ALL" bad CGI quickie jobs. It was so noticeable throughout the film that they really tried as much as possible to use practical sets and effects that we were constantly commenting on that, and that it was commendable. It's kind of a rarity these days, so kudo's to the production for trying their hardest to keep it real. I also liked how bloody and violent it was. Where they easily could have gone the PG route, like Conan The Destroyer did, thus killing the franchise, they went for a hard R, and not watered-down to fill more theater seats. I was surprised at how much blood was spilled in this, with a lot of it so over-the-top that it was almost funny at times. I liked the fact that it was actual blood packets being exploded and not bad CGI blood, but it was a little ridiculous. I mean, what's the point of wearing all that armor if it just takes one swipe of a sword and you're dead, regardless of all that armor? Now onto the negative. Jason Momoa is no Conan. I'm sorry, but it's just such a wrong fit. But even looking past the casting choice, the film just looks and feels like another episode of pretty much any fantasy show on TV, which is one of it's biggest problems. Marcus Nispel is a fine director, but this film should have looked and felt more EPIC. On the plus side, he strayed away from his usual hand-held camera technique and took more of a streamlined cinematic approach, but it still sort of falls flat visually. 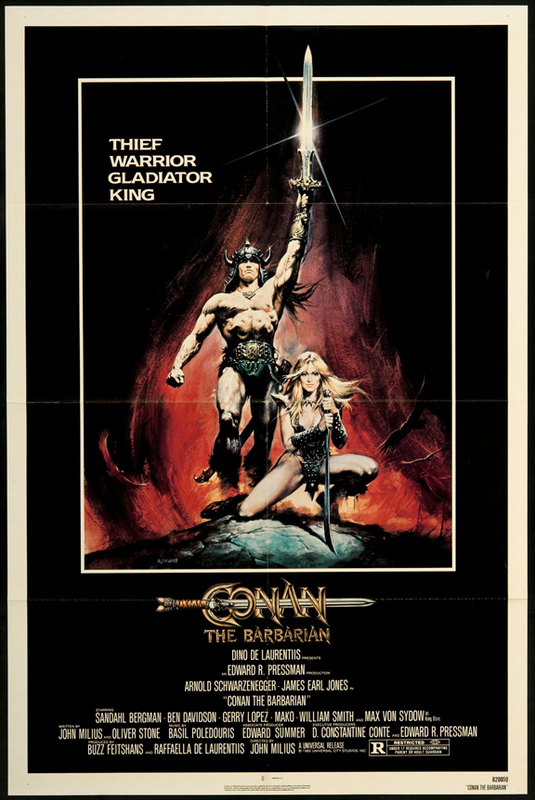 When you look back at the first Conan film directed by John Milius, it screams big and epic at every turn. Everything from the casting of Schwarzenegger, to the lush widescreen cinematography, to the organic look and feel of using 35 mm film. 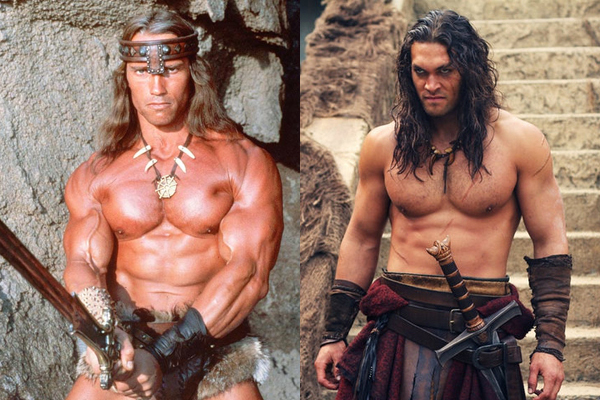 It all makes a huge difference, and what the original Conan The Barbarian possessed and used to it's full advantage, the new Conan film is sorely missing. It may just be that we're in a huge Swords & Sandals Fantasy boom right now with Game of Thrones leading the pack, but if you're going to attempt something for the big screen, you need to make it bigger. Nispel in the directors chair was a wrong choice. He's proven himself in the horror genre, but for some strange reason he's been the go-to guy for remakes, with Texas Chainsaw Massacre, Friday the 13th and now this under his belt. There's nothing in his resume that could have suggested he could handle a big property like this, or a film as epic, and the result speaks for itself. Bottom line is that none of this feels big, and it really needed to be. And not all of the failings of Conan lie on director Marcus Nispels shoulders. 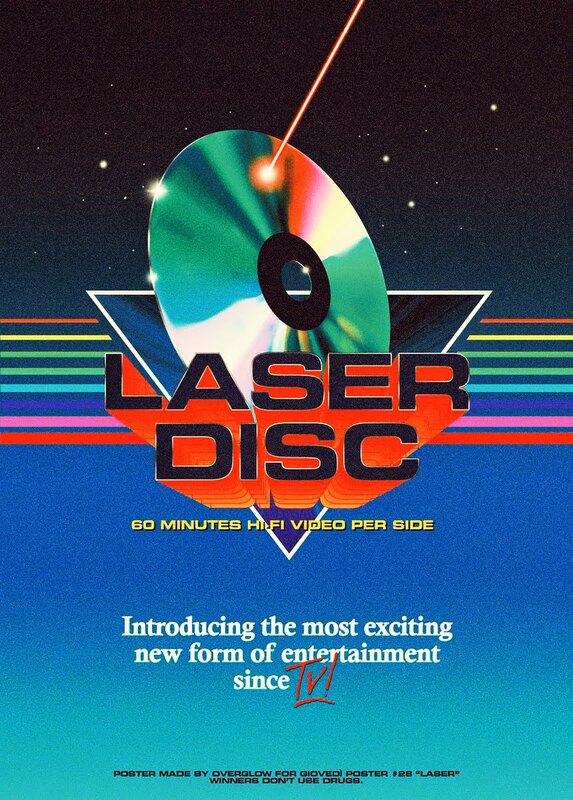 There are a lot of reasons that keep this from being great, or bigger, like the score for instance. The original Conan film boasted a thundering score by Basil Poledouris that has now become legendary. Sadly, I never once noticed a cohesive theme to any of the music here by Tyler Bates, nor anything that resembled a theme in general. It's just kind of....there. No frills or inspiration. It literally brings nothing to the table, nor does it add any level of excitement to the scene. When we take a look at the over-photoshopped poster art, it's yet another sad reminder of where the film industry is these days. Where as in the original film we got a gorgeous and iconic hand-painted poster reminiscent of the old Conan comics, novels and gorgeous paintings by Frank Frazetta, keeping in the tradition and theme of the larger-than-life character, the poster art for this looks nothing more than a collection of images from the movie, rung through a photoshop program with dozens of filters applied, giving it a Made-For-TV quality that we've come to expect from every single other big budget spectacle. Marvel is the most guilty of this, but it's so sad when it's just become the norm to do it this way now. I can't even remember the last time I've seen an actual hand-painted poster design for a new film. By the time Conan (2011) came out, it had been nearly 30 years since the original Barbarian classic. Anticipation was high to say the least, and you would have thought that the production, and hell even the studio, would have done everything in their power to give us the Conan film we've been waiting nearly 3 decades for. Sadly, this is not that film, and it's safe to say that the consensus is that it didn't meet our expectations, and there are no plans for anymore. Too bad for Momoa though. I'd read a few articles when this first came out where he was quoted as saying he had a whole series of films already planned in his head if this became successful. Personally, I enjoyed it. If you can disassociate this with the name Conan, it's actually a fun and well-made fantasy film with a ton of violence, bloodshed and impressive use of practical effects. On it's own, outside of the Conan The Barbarian universe, it's quite enjoyable. As a Conan remake/reboot/re-imagining whatever, it sadly pales in comparison to a film made 30 years ago, without the benefit of CGI, and a bigger budget. Yeah, I watched this last year. I actually thought Jason Momoa was a decent choice looks-wise but he had very little to do or say in the script (and they don't even introduce him until about 30 minutes in). The whole script just sucked. The one part I did enjoy was the young Conan part at the beginning - where he comes back to the village carrying loads of enemy heads. That was pretty awesome. It's funny because I feel he was all wrong for the part. LOL. But, I did have fun with it outside of the Conan universe I guess. The script and direction were so weak, but it was violent and bloody, utilizing some practical sets and such. But it loses all that in the end with some bad CGI work. Hated this one every step of the way, I just couldn't believe such a crappy film was made when the original is so amazing. Where I could by the first Conan film as an alternate reality...this one just felt goofy in comparison. It just wasn't serious enough in my opinion. Also Marcus Nispel? Whyyyyyyy.....I think they gave it to him because he'd done Pathfinder which I hated as well...I just don't like the way Nispel edits his movies...they feel choppy, the images don't flow smoothly sometimes which to me is one of the worst things that could happen to any movie. I just hope they finally get to make that King Conan movie with Arnold and bring these films back to their former glory days. Here's hoping! Yea, Nispel was the absolute wrong choice. I don't know how or why they decided on him of all people. And I feel you, I hate Pathfinder. Cool premise, but it was so fucked up by how Nispel shot it. It could have been a decent film. 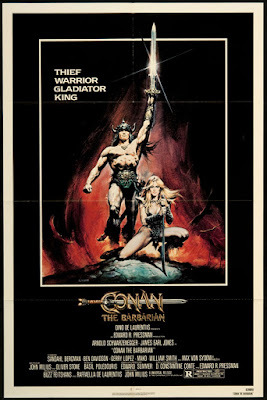 I just watched the original Conan and was floored by how simple, yet gorgeous it looked. Here they just didn't seem to care. You get no sense of scope, or magic. It's just kind of there. We waited so many years for a Conan film, only to get this, and because of this mediocre film, we'll never get another unless King Conan with Schwarzenegger actually goes through.